The Margaret H. Rollins School of Nursing at Beebe Healthcare recently celebrated the Class of 2016 graduation with 21 graduates at Epworth United Methodist Church in Rehoboth Beach, Delaware. Mr. Jeffrey Fried, FACHE, President and CEO, Beebe healthcare, was the commencement speaker. Ryan Gray, President of the Class of 2017, presented congratulations to the graduates. Rachael Springer, President of the Class of 2016, shared class reflections and a video with her classmates. The Honorable William Swain Lee, Chair of Beebe’s Board of Directors, presented the Board of Directors Award for the highest academic achievement to Marissa Setzer. The Beebe Healthcare Medical Staff sponsored the Salutatorian award for the second-highest academic achievement, which was presented by Dr. R. Alberto Rosa to Angela Kontoulas. The Alumni Award, given for Medical-Surgical Clinical Excellence in District Nursing, was presented to Megan VanSant. The Patient Care Leadership Award was presented to Rachael Springer. The Beebe Auxiliary presented their award honoring the graduates who excelled academically, clinically, and in community involvement, to two graduates this year, Beth Willing and Courtney Masterson. Danielle Marsico received the Cordrey-Cottingham Award, in honor of Eleanor Cordrey and in memory of her sister Virginia Cottingham for demonstrating commitment, professionalism in nursing, and sincerity in her practice. Crystal DiMattia received the Dr. David Howard Memorial Award. The Bayside Health Association Award honoring the memory and characteristics of Alison Trout was presented to Lindsay Hetrick and Jillian Zuppo. Kristin Hester was honored with the Faculty Award recognizing the attributes of diploma education. Cancer in Common of Rehoboth honored Angela Kontoulas with its award recognizing the graduate with an interest in cancer and one who represents caring and compassion in nursing. Kevin Burkett was the recipient of the Delaware Hospice award honoring an exemplary graduate exhibiting a compassionate philosophy in all aspects of care. Beth Willing was honored for her perfect attendance. Beebe Healthcare Chaplain, Keith Goheen, gave the invocation and the benediction. Karen L. Pickard, MSN, RN, CNE, Program Administrator of the School of Nursing, along with Class Advisors Tracy Bell, MS, RN, CMSRN, CNE, and Terri Wyatt, MSN, RNC, GC-C, CPLC, CNE, presented the graduates with their school pin. Mr. Fried presented the diplomas. Members of the Class of 2016 are: Sara Adams, Kevin Burkett, Katie Daniels, Crystal DiMattia, Samantha Dunbar, Eve-Joellyn DuPree, Kristin Hester, Lindsay Hetrick, Angela Kontoulas, Adam Lange, Danielle Marsico, Courtney Masterson, Meg Piernock, Ashley Rego, Laura Richards, Marissa Setzer, Rachael Springer, Danielle Steigerwalt, Megan VanSant, Beth Willing, and Jillian Zuppo. A reception followed the graduation in the Epworth United Methodist Church Fellowship Hall. The Margaret H. Rollins School of Nursing, at Beebe Healthcare, is the only hospital-based nursing program in Delaware, and is accredited by the Accreditation Commission for Education in Nursing (ACEN). The diploma in Professional Nursing is awarded at the completion of the curriculum, qualifying graduates to be eligible for National Council of State Boards of Nursing NCLEX examination, leading to licensure. 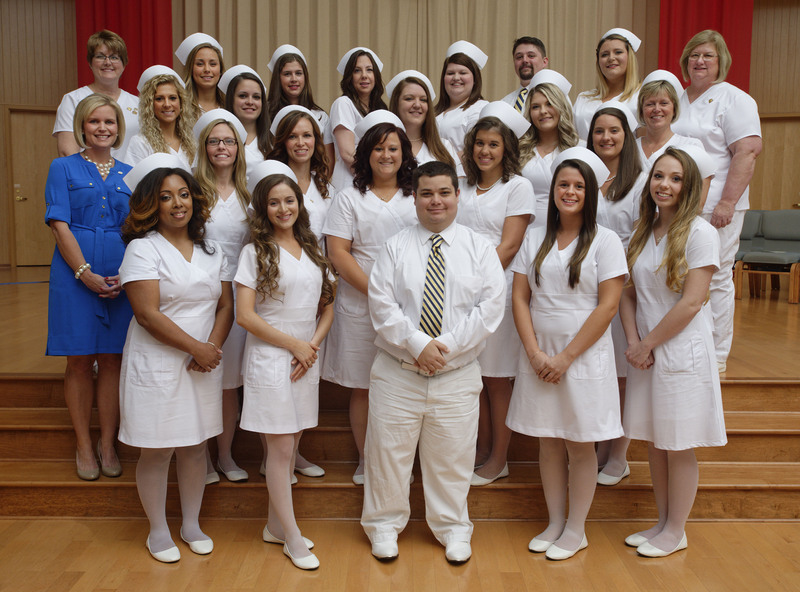 The School of Nursing graduates have consistently had NCLEX pass rates that are above the national average. Graduates can complete a Bachelor of Science Degree in Nursing at the University of Delaware or Wilmington University through well-defined articulation agreements. Caption: Pictured here, left to right, are: Back row: Tracy Bell – Class advisor; Danielle Marsico; Samantha Dunbar; Ashley Rego; Beth Willing; Kevin Burkett; Courtney Masterson; and Terri Wyatt – Class advisor; Third row: Sara Adams; Laura Richards; Meg Piernock; Megan VanSant; and Angela Kontoulas; Second row: Karen Pickard – Program Administrator; Danielle Steigerwalt; Crystal DiMattia; Rachel Springer; Lindsay Hetrick; and Katie Daniels; Front Row: Eve-Joellyn DuPree; Kristin Hester; Adam Lange; Jillian Zuppo; and Marissa Setzer.